Here's one of the superb new online slots game. In the centre of Rome, stands an immense amphitheatre, known as the Colosseum. Today, earthquakes and stone thieves have left it partially ruined. 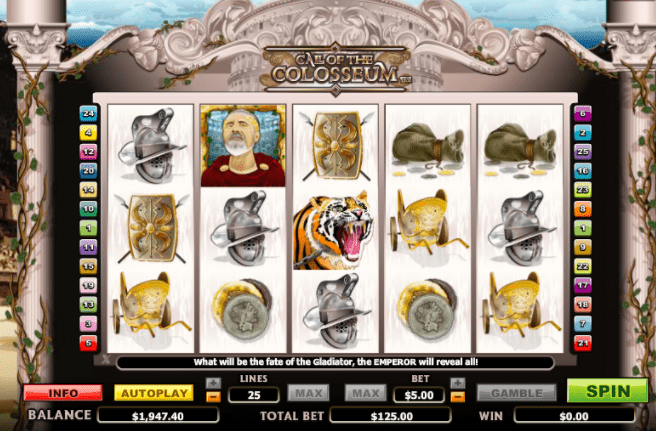 NextGen’s online slots game Call of the Colosseum takes us back to its heyday in Imperial Rome, when it would roar with the sound of gladiator fights, staged battles, and mythological dramas. Ancient Rome is notorious for its lavish culture, and this game conjures up this sense of opulence, both in its graphics, and its rich winning opportunities. Check out our entire list of slots games now. Amongst their catalogue, NextGen has something for every type of slots player. There are accessible offerings with bold designs and intuitive gameplay, ideal for online slots newbies, as well as more elaborate, endlessly entertaining, and detailed titles that will dazzle and surprise even the most jaded slots expert. If you love promo's, get the best slot bonuses today. WILDS – Emperor symbols substitute for any symbol apart from SCATTERS. SCATTERS – 3 or more SCATTERED round shield symbols award 10 free spins with doubled prizes. Every Emperor that appears during these games will give either a ‘thumbs up’ or a ‘thumbs down’ signal, with a ‘thumbs up’ awarding up to 3 additional free spins. GAMBLE – choose a card colour or suit to gamble your win. The correct colour doubles the win, and the correct suit quadruples it. This game’s clear layout makes it a delight to navigate, and there are easy buttons below the reels to adjust paylines and set the Autoplay function from 1-100 autospins. 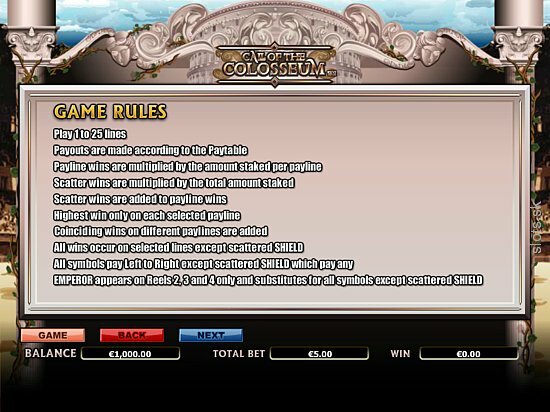 The bet can easily be adjusted over a wide range, making the game satisfying for casual players and high rollers alike.